Famous for housing revered Sufi saint Sheikh Noor Din Noorani aka Nund Reshi’s shrine, Chrar-e-Sharief town is equally known for a unique specialty of dried pears—Tang’hachi. Dried pears are the most liked among other varieties of the hill town. Snowbound, curvy thoroughfare ahead of Algiers-type staircase hill houses of Chrar Sharief hits a dead end near the native unique traders—beating blues of a wintry day near their kiosks or inside their shops. Their merchandise hints at Kashmir’s hoarder past, besides highlighting the different specificities in the Vale’s diverse pockets. In Chrar Sharief, the name of that specific delicacy is dried pears, called Tang’hachi in local parlance. 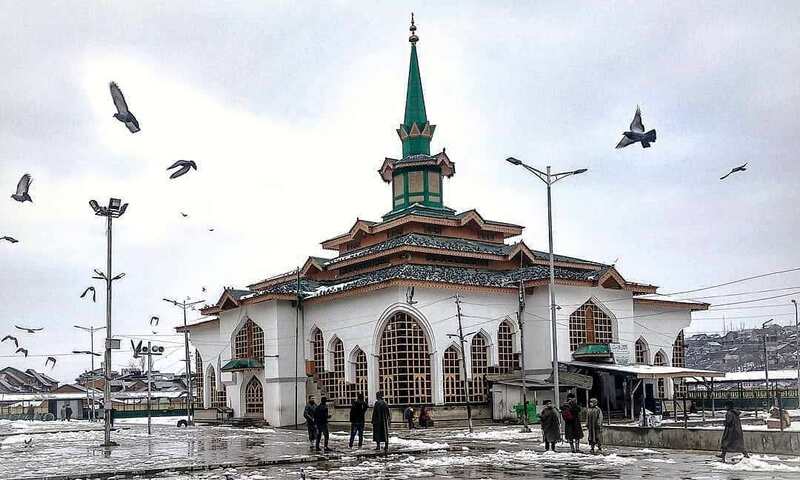 In this totem-type hilly town of Budgam, the bustling marketplace—just outside the gateway of saint Noor ud Din Reshi’s shrine, the merchants have displayed their kiosks akin to some fabled bazaar of yore. The captivating setting of the souk is uplifted by lively traders, inviting tourists and faithful to their Tang’hachi outlets with smiling faces. Among these warm and welcoming traders, Nazir Ahmad Sodagar’s shop stands a couple of yards away from the shrine. Sitting behind the embellished circular steel treys with variety of ‘tobrukhs’—Sherin, Khazir, Nabad and Tang’hachi—the trader talks about his hometown with a storyteller’s eloquence. The quintessential Sodagar terms the practice of dried pears as an ancestral activity of the farmer clan of this township. As a roaming kid, some forty years ago, he used to see his predecessors selling the delicacy in twig jars and wicker baskets in the town. But that vintage aura stands faded now. Behind his shop lies a spacious deserted park area which once housed Chrar Sharief’s ethnic population in their mud and brick houses. But the 1995 inferno let loose to “flush out” Mast Gul and his Pashtun guerilla tribe has since then dispersed the natives to other places. Some of them have subsequently come to populate the nearby areas—like Alamdaar Colony, tucked at some distance before the shrine. With that gutted shift, the characteristic autumnal sight of Chrar-Sharief—the Tang’hachi carpeted rooftops—also waned. The bygone pervasive practice is now reluctantly being carried out by some old town natives spared by the devastating flame, and some hamlets around the sanctum sanctorum, including Telsur, Zipanzal, Kanhdajan, Zaloosa, and others. On the basis of its taste and size, Tang’hachi are of three types—Wanhaet, Sirkhaet and Farashi. Wanhaet is a tiny and light-weighted Tang’hachi, having a moderate taste. Sirkhaet is sour and sugar free, and is believed to be beneficial for diabetes patients. Farashi is a large-sized delicacy, with alluring look and mouth-watering taste. “But customers hardly know this difference as they generally purchase Tang’hachi as tobrukh,” Sodagar smiles. In a bid to brand Tang’hachi, State Horticulture Department in recent past sold a concept to growers on the style of some trade boosting formula. They were assured that they’ll be given better-packaged Tang’hachi to woo high-end customers. At the west-end of the market, pear grower Ghulam Ahmad Dar, 46, explains the process of converting juicy pears into dried ones. “Since it’s our traditional activity, women equally participate in its preparation,” Dar, a soft-spoken man, says. A local legend has it that the practice took roots during bygone harsh winters, when snapped communications due to snowbound routes would cut the township from the outside world for months together. But over the years, evolution of dried pears as Chrar Sharief’s specific delicacy has given it a unique distinction. It is heartening to read such kind of stories that otherwise have got buried under the wave of globalisation and sidelined by the mainstream media. It reminds us of the memories of our rich cultural practices and keeps our culture alive. The work of the reporter is commendable indeed. At least something worth after long besides conflict content to read and make my breathe ease. Nice reporting. Saw manytimes whenever i visites Char e Sharief but réad firt time through média. Nice store.